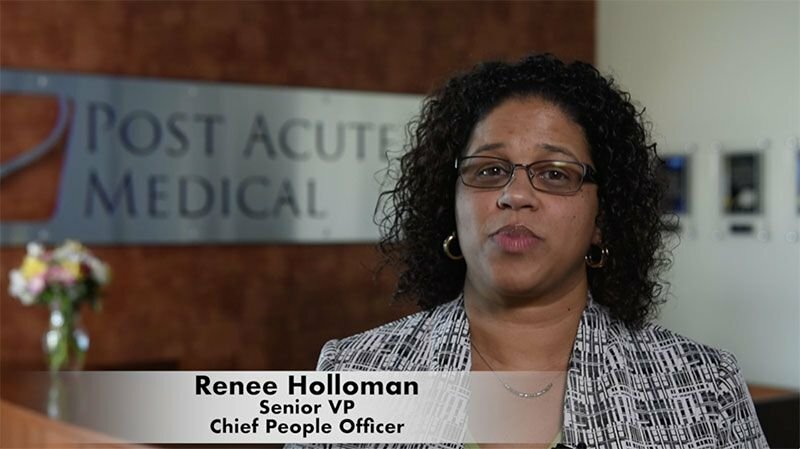 Renee joined the Post Acute Medical team after spending more than 25 years in both business operations and human resources in the hospitality industry. She understands that we care about the people and communities we serve, and that is what sets us apart from our competition. Renee helps us create a diverse and inclusive workplace culture where we value, respect, and reward our employees. She knows we need a team of employees on the front lines who love helping people. We put our greatest asset – our people – first, which allows us to care for our patients and be the most trusted source for post-acute services. As the Chief People Officer, Renee oversees all human resource activities critical to our mission, vision, culture, and strategic priorities. A versatile and results-driven leader, she thrives in fast-paced, growing businesses and has an exceptional ability to galvanize senior leaders across functions to collaborate and solve the complex challenges of having thousands of employees across multiple states. Renee and her team help provide a heartfelt employee experience, and they ensure our leaders have the tools and resources they need to coach and develop our leaders of tomorrow. A life-long learner, Renee believes strongly in continuous development and holds an Associate’s Degree in Marketing, Bachelor’s Degree in Business Administration, and a Masters of Professional Studies in Organizational Leadership. Renee is a Marshall Goldsmith Certified Executive Coach, and she excels at project management and presentations that inform, involve, and inspire those around her. She leads with heart, and her team – and peers – follow.